That ® sign in our headline is no typo; Andrew Shelton really trademarked the phrase "So Much Cooler," along with the name of his product, TrackPack, the lightweight cooler/backpack combination he first envisioned while still an English major at Wabash. And believe it or not, Shelton credits his studies in English for part of his business acumen. "At Wabash, I focused on literary structuralism," Shelton says. "I enjoy analyzing the component parts of a literary work and reflecting on how they help to form the work as a whole. I think building a company and writing a book are similar trains of thought. "It was my love of structuralism that helped me understand how the many components of a business need to be arranged to come up with a working product. There is no step-by-step formula…you have to figure it out on your own." Initiative is what distinguishes an entrepreneur from someone with a great idea. The initiative to implement your idea comes from creativity, determination, and incremental goal setting. Ideas come to fruition through a series of small steps —it doesn’t all happen in a day. You just chip away, each day at a time, while keeping the overall objective in mind. To keep the long-term goal in perspective, you can’t ride roller coasters…there are ups and downs. But consistency and tenacity are what wins the war. Most importantly: Don’t let anyone tell you no. You are your own best advocate, and no one is going to do this work for you. Don’t let an obstacle prevent your idea from ever being tested. 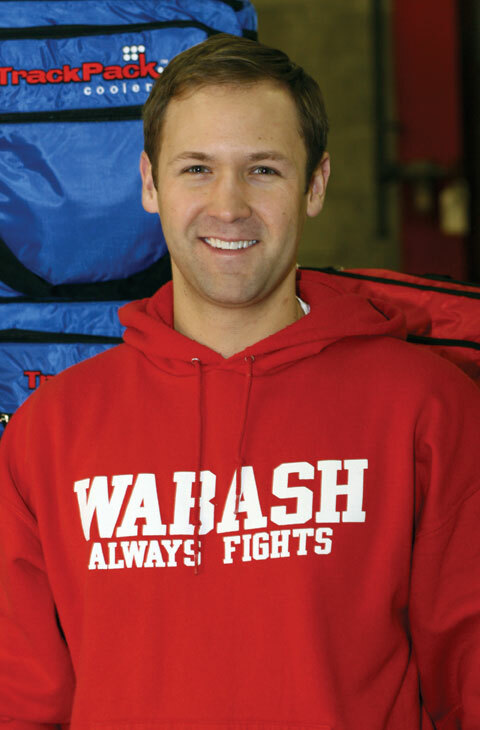 What does Wabash need to do to instill that entrepreneurial spirit in our students? I’d like to see a program in which the College would fund a class to run a company as a group. A mentor would help guide, but the students would come up with a concept, figure out how to produce it, determine a marketing strategy, and ultimately take their idea to market. Better to figure it out under guidance than all by yourself like I did!? You can call it networking. You can call it glad-handing. You can call it leveraging relationships. But as Andrew Shelton ’03 can tell you, when you’re a young entrepreneur, there’s no substitute for using every personal connection you have—and building more every week. Shelton has built an elaborate web of relationships to help him start his business, TrackPack Coolers, which makes backpacks that keep drinks cold for people on the go, including soccer moms, NASCAR dads, college tailgaters, hikers and campers. Using his connections, Shelton raised $250,000 in startup funds, secured a patent, located a product designer, found a sourcing agent who steered him to a factory in China, located warehouse space on Indianapolis’s northwest side and recruited a part-time sales force. He has sold more than 8,000 units in a little more than a year. His story could be a lesson in the importance of entrepreneurs building and maintaining relationships—a critical skill for small-business owners who face long odds just getting their businesses started. Roughly half of all startups fail within five years, according to the Small Business Administration. "If you don’t have a track record, but you have a good idea and lots of hustle, you have to use your networks to get you started," says Larry Cox, director of the Midwest Entrepreneurial Education Center at Ball State University in Muncie. "It can be the difference between success and failure."